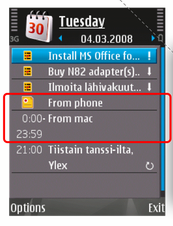 Have you ever thought, why all-day events from iCal are synced via iSync as meetings from 0:00 till 23:59 on your Nokia E51 (or any other Symbian S60) mobile phone? While the Nokia calendar supports all-day events as „day note“ (and also syncs to your mac properly!) there should be a way to change the behavior. hasse.org wrote about this problem in his article „Fixing the Nokia N82 iSync Plug-In„. I used the instructions to change my E51 isync plugin. Just copy the file from Nokia_E51_1v1-allday-phoneplugin.zip to /Library/PhonePlugins. Use at your own risk! You might encounter sync problems. I personally reset my sync profile and soon ended up with duplicate entries for calendar and contacts. I you have the same problem, delete all calendar and contacts entries and reset your iSync-E51 connection.